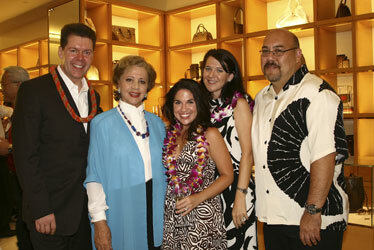 A reception for the "A Little Night Music" cast was held at Louis Vuitton Ala Moana after Sunday's matinee. From left are: Louis Vuitton's Regional Vice President Dale Ruff, cast member Rosalind Elias, cast member Kristin Stone, Hawaii Opera Theatre's Executive Director Karen Tiller and HOT's General and Artistic Director Henry Akina. Louis Vuitton presented the HOT Summer Season show.